UDM Downloads > Manic Minefields! 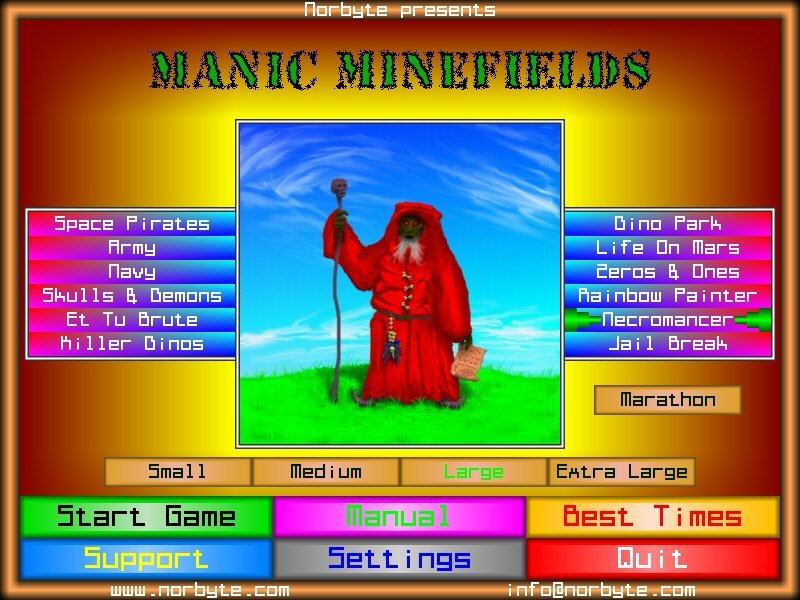 Manic Minefields is really 12 pumped up minesweeping games in one, as it features 12 uniquely designed minefields with beautiful graphics and crisp sound effects, to choose from. Some of the minefields have special rules (i.e. obstacles), and some have different ways of displaying the numbers (i.e. dice, Roman numerals, foot prints etc.). Other features include a marathon mode, 4 sizes, a hint/help function and import/export best times. If you haven't played any of the games in the minesweeper genre, don't worry! It's an addictive and fun puzzle game where the goal is to find and mark all the mines in a field, with the help of clues. These clues are numbers that tell you how many mines you can find in the adjacent squares. It's really quite easy to learn, and the rules are explained within the game. It's a great workout for your brain!